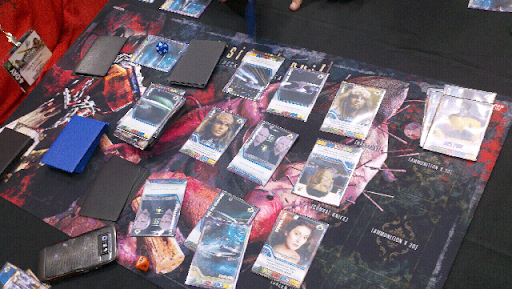 I tried Bandai's new Star Trek deck building game. For those smart aleck commenters who think theme can override my aversion to randomness, this is proof positive that it cannot. This game left a very sour taste in my mouth after 20 minutes and I doubt I will give it a second chance. I was almost relieved when the other people demoing left to do something else, cutting the game short. Imagine Dominion, except that instead of piles of cards to buy from, each pile randomly chosen but containing the same card, you shuffled every card in Dominion together and dealt out nine of them. On your turn, you may only purchase one of these nine or one of the three crew (read: treasure) cards. You can also discard one of these nine cards from the table to replace it with a new option to purchase, but essentially you can only pick from nine random cards. This has two effects. First, it is impossible to strategize over multiple turns, as you haven't the slightest clue what will be available for purchase and opponents might just luck into a great card happening to appear on their turn. Secondly, there is a huge learning curve, as you're constantly reading tiny text on a bunch of new cards when it is time to decide what to do. To be fair, the game does have something Dominion doesn't: a purpose driving you other than deck building for its own sake. At the end of your turn you have the option of Exploring Space. To do so, you flip over a random challenge card from a separate deck. If the cards you've played this turn (which, in addition to their value as treasure and their gametext have challenge-solving stats) give you enough of the needed stat, then you could score the card. This is the only route to victory, as you need to score 200 points. However, if you fail the challenge or even get attacked by a more powerful starship, you could suffer setbacks which essentially pollute your deck with their version of Copper (a better idea than player elimination). Unfortunately, even this avoidance of Dominion's inevitable "What's the point?" is poorly executed, as the card drawn when you explore can vary wildly from an automatic destruction of your ship to a freebie prize that required nothing on your part but to be lucky in topdecking it. This is a game with an unforgiveable amount of randomness.